Even if you’re not trying to get swole, these movements will help you with everyday movements. Lifting weights can often seem reserved for the fittest among us, those muscle-laden guys and gals pumping iron and getting swole on a daily basis. But the truth is, muscles aren’t just for impressing potential romantic interests—they’re how you get through every single day. You may not want bulging biceps, but you probably do want to be able to lift your suitcase when you travel. And you may not care about setting a new squat record, but you’d probably like to get up from chairs without assistance in your old age. Both of those motions would be a lot easier—and less injury-prone—if you did some basic weight training. Some trainers like to call this “functional fitness,” meaning exercises in the gym that will translate to your everyday tasks. These sorts of workout routines are crucial to maintaining the muscles that will carry you into middle and old age. By age 70, the average person has lost about a quarter of the muscle mass they had at 30, and by 90, they’ll have lost half. You can’t stave off all of that by weight training, since muscle quality declines even if you maintain mass in old age, but studies suggest you can maintain more functionality (and even keep your bones stronger) with resistance training. So we asked an expert what he’d recommend absolutely everyone do in the gym, even if impressive musculature isn’t their goal. First, though, a disclaimer: like all fitness advice, this isn’t actually universal. You may have particular health issues or physical disabilities that prevent you from doing these exercises, and that doesn't mean you can't stay fit with exercise. Perhaps your mobility isn’t very good or you have an old injury that acts up. Or maybe you just have a weakness that you need to fix, but that will make the exercises outlined below impossible in the meantime. We’d always advise that you talk to a professional trainer about your body’s nuances to get personalized recommendations. That being said, Greg Nuckols is a world-record setting powerlifter—on top of being a longtime coach and the expert behind Stronger By Science—and these are the exercises he’d suggest as the bare minimum for most people. “One of the two things that I would recommend just about everyone do is some sort of loaded carry,” Nuckols says. “One of the main things so many older adults complain about is getting groceries out of their car and into their house, and I think that loaded carries are going to directly transfer to that.” You may also know weighted carries as farmer’s carries, but the idea is the same: you grab equal weights in each hand, hold them by your sides, then walk. If you’ve never handled weights before you can start as light as you need. 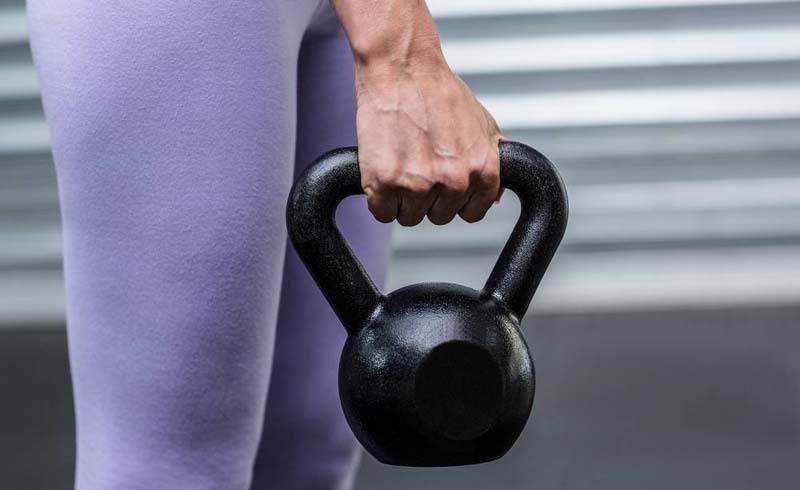 Small dumbbells work well, and as you progress you can start using kettlebells, which may mimic a hanging grocery bag or suitcase better than dumbbells. The important thing is to keep increasing the weight to make it challenging for you. You can only build muscle by straining the muscle you've already got, so if you’ve gotten to the end of your workout and you’re not feeling some degree of muscle fatigue you may not be pushing yourself enough. If you have no idea what a trap bar is, just bear with us for a moment. A deadlift is one of the core powerlifting moves: you grab a bar in front of you and stand up. There’s a lot more to the technique, but that’s the essence of it. A trap bar deadlift is the same motion, except instead of grabbing a barbell you use a contraption that you stand inside. If you can’t lift the empty trap bar (they're often heavier than an empty barbell, coming in at around 60 pounds), you can start by doing the same deadlifting motion holding two small kettlebells at your sides. And again, you need to keep progressing up in weight to keep pushing your muscles. As we’ve written before, squats work a ton of muscles, and a lot of trainers will advise everyone learn how to do at least a basic weighted squat to help with one of the most essential daily activities: standing up from a chair. Chris McGrath, a fitness expert at the American Council on Exercise, recommends them (along with deadlifts) precisely for their functionality. Squats help you learn how to engage your gluteus maximus and quadriceps properly, which means you’re less likely to hurt your knees. Plus they help with crucial flexibility in your hips, knees, and ankles. The easiest way to start is with an air squat (which is exactly what it sounds like—doing a squat without holding any weight). Once you’ve mastered that you can add resistance in a variety of ways. One option is holding a dumbbell or kettlebell in front of your chest. Another is a traditional back squat, where you hold a barbell up by your shoulders. Whatever you end up choosing, squats—like the rest of these movements—will help you move through your life with greater ease. You don't have to have dreams of getting totally swole to make a commitment to working out worthwhile. Kettlebells are a great tool for increasing your strength gradually.